This article describes how to use the Add a Campaign overlay/form to add a campaign within your DivvyHQ account. To create a new campaign, click the +Add New button in the upper right, and click Campaign. 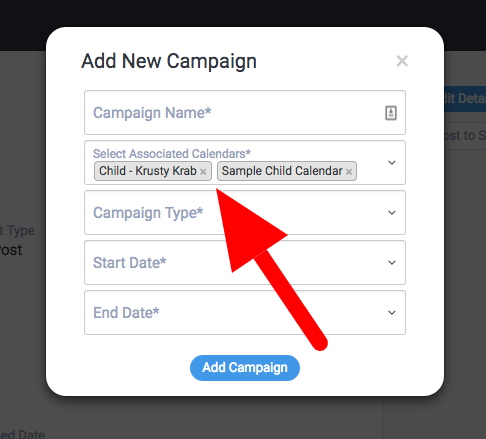 Type in your campaign a name and then select it’s associated calendars. Since certain team members and content types are attached to specific calendars, this calendar selection ensures only those people will be able to see and manage content for this campaign. Regular Campaign - promotions, discount offers, product launch, etc. Lastly, select the campaign’s start date and end date. When you’re satisfied with these details, click SAVE. Note: A campaign will display inline on the calendar if the date span is 14 days or less. If the campaign spans for more than 14 days, the campaign will display at the top of the calendar. Your new campaign will now be visible as a spanning event on your DivvyHQ calendar, and available in Divvy’s new Campaigns dashboard.